Following the end of the NERVA work, USAF took over research in nuclear propulsion [Lawrence, 2008], one of its priorities being a nuclear-powered reusable space tug (more formally, the Orbital Transfer Vehicle (OTV)). With all the safety caveats, a space tug is a striking alternative to orbit raising chemical stages for commercial satellites. 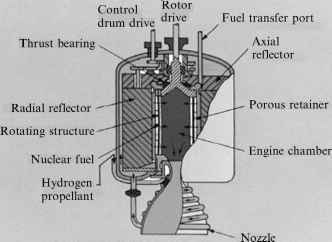 USAF started in the mid-1970s by modifying the NERVA I reactor, recognizing it rightly as the critical element of the entire propulsion system. The NERVA family of reactors was still too massive (and too powerful) for the type of missions USAF had in mind, and that was what started the particle bed reactor (PBR) concept. The PBR has a configuration taking advantage of advances in fuel manufacturing. The structure of all NERVA-Kiwi family was based on long fuel bars, or rods. Cold hydrogen flowed inside multiple channels present in each rod, the entire assembly exhausting hot hydrogen inside a conventional nozzle. This geometry is essentially one-dimensional, packing relatively low energy in the unit volume. In PBR, the fuel (235U-rich uranium oxide, UO2, or other more advanced uranium-ceramic compound) is stored inside small spheres or beads, e.g., 500 mm in diameter, in which the layering ofmaterials encapsulating the fuel is similar to that in conventional rods. A typical bead design consists of a fuel-rich core surrounded by graphite and enclosed by an inert layer of ZrC. The particles are packed inside two coaxial cylinders, the hot inner one made of carbon-carbon composite and the outer made of aluminum alloy. These fuel elements are clustered in the engine and embedded inside the moderator, for instance beryllium, or 7LiH. The hydrogen propellant flows inside the inner cylinders, where is heated, expanding in a conventional nozzle [Beale and Lawrence, 1989]. One of the many particular schemes of PBR NTR is reported in Figure 7.21. Figure 7.21. Schematic drawing of a particle bed reactor with power controlled by a rotating drum. as 10 [Bennett and Miller, 1993]. Power density may reach 10-75MW/dm3. For instance, at 10MW/dm3, a 1-GW reactor could be compacted inside a volume less than that of an oil drum. A Russian concept using a ternary carbide fuel claimed to have reached 40 MW/dm3, power density of order 0.3 MW/kg, and gas exit temperature 3,100 K for 1-hour operation, or 2,000 K for 4,000 hours. USAF tested PBR sub-components for nearly 20 years, with a maximum T ~ 3,000 K maintained successfully in a single fuel element, but never designed a complete rocket engine. With hydrogen temperatures of that order it is reasonable to assume Isp could be close to 1,000 s. The power density actually measured was ^40 MW/dm3, similar to that tested in Russia, confirming the advantages of PBR over conventional reactors. 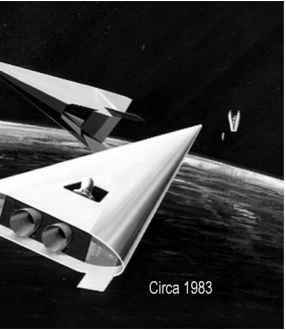 This work was part of the USAF SNTP program, directed mainly toward building a space tug, and was terminated in 1993. In absolute terms, the net gain in Isp foreseeable with this type of NTR propulsion, of order 100-150 s, is significant but still barely a 13% gain over the NERVA I baseline engines. On the mass budget side, however, engine mass for the same thrust (3.3 x 105N) was estimated at only 1,700 kg, plus some 1,500 kg for the shield, quite an improvement. Thus the thrust/weight of an actual engine should reach eventually about 20 : 1 vs. the 4 : 1 ratio achieved by NERVA I. Part of this improved performance is due to the much lower pressure drop inside the reactor compared to a NERVA-type configuration (pressure drops of order 5-6% appear feasible with PBR reactors). Major technology problems foreseeable with a PBR engine are the durability of materials at its high design temperatures. At USAF this was the motivation for investigating CERMET (CERamics-METal) technology for fuel rods. Shield weight and volume issues are similar to those in NERVA-type engines. All things considered, a future PBR rocket engine should be much lighter and more compact than a conventional NTR. A fast interplanetary mission to Mars would entail many hours, or even days, of operation at full power; the behavior of the engine operated during this time at 3,000 K and, say, 60atm is probably the single most important consideration in assessing the viability of PBR as a space thruster, while there is no question that its fuel topology is a major step forward.